Have you ever been to an auto expo??? It is where manufacturers showcase concept cars with futuristic design and high-tech interiors that help flaunt a brand’s design dimension and tech advancement. One can witness these exciting machines at auto expos or read about them on auto magazines as mainstream media wait to get a hands-on experience when they are launched. Here is a list covering the showcase of top concept cars at auto expo 2018 by leading manufacturers in India . 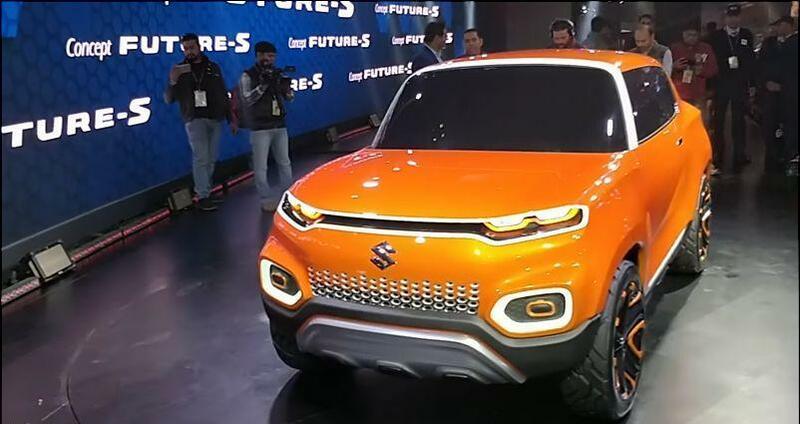 The micro SUV, Concept Future S sports a modern and trendy design with vertical contour elements. Sleek head and tail lamps give the micro SUV an aggressive look while the orange body and pearl white accents complete the design language. A flat bonnet, high ground clearance, wide arches, and rear bring out the compact-urban SUV stance that Maruti envisioned. The orange and white theme continues indoors giving the cabin a lively feel with the central infotainment system grabbing all the attention. As its name suggests the Future S is still a concept which will evolve into Maruti Suzuki’s entry-level hatchback and take on its sibling Alto and rival Kwid which has the market all to itself from the design perspective. 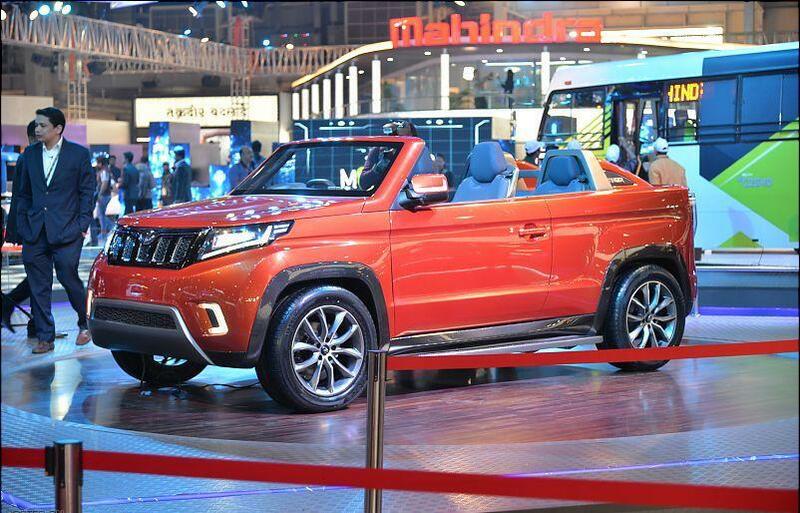 Jaws dropped at the auto expo 2018 as covers came off from TUV Stinger (concept), India’s first two-door, sub-4 meter convertible SUV. Taking cues from the TUV 300 the Stinger is as bold as it is stylish. Stinger’s fascia features sleek a large grille, raised A-pillars and flat bonnet adding to its upright stance with LED Head and tail lamps giving it a gallant yet quirky guise. The intentionally styled Stinger’s interiors get all the more spacious with the roof removed. A race steering wheel and a 2+2 seating further accentuate the rugged appeal with partly visible spare tyre placed behind the rear seat. The humongous digital infotainment bang in the middle is hard to miss even from outside the car. Mahindra has not confirmed the production of the Stinger and said it will take a call depending on the response it garners at the Expo. Tata’s new candidate into the premium hatchback segment, the 45X concept, sheds light on what the company’s forthcoming model would look like. The 45X concept sports European design elements with bold and assertive creases with well-defined humanity line linking the slim lights and grille. This Tata concept is built robustly with many eye-grabbing details like a solid ridge flowing down from the A-pillar, darkened upswept styling elements, and skirts. Tata cars sporting the Impact Design 2.0 will have segment-leading wheel sizes that look like 18-inchers. Well-defined wheel arches, distinctly cut rear doors, razor-edged rear windscreen rake and blackened-out roof spoiler extruding from the contrast roof are high points of the 45X. Showcased behind a glass enclosure, the concept keeps the cabin veiled, for now. The Sports EV that brings forth the retro styling of a 1970s Honda incorporated into a boxy, modern hatchback body with an electric powertrain. The design philosophy reaches back to the ’60s when motorcycle-centric Honda started trying its hand in cars. Inspired by the early plucky models this Sports EV sports an upright profile and smiley-like fascia and rear with happy-go-lucky graphics. Sports EV concept has a long-hood and short-rear-deck layout like the original S600—as opposed to today’s gas-powered S660 roadster with its cabin set far back in the body. 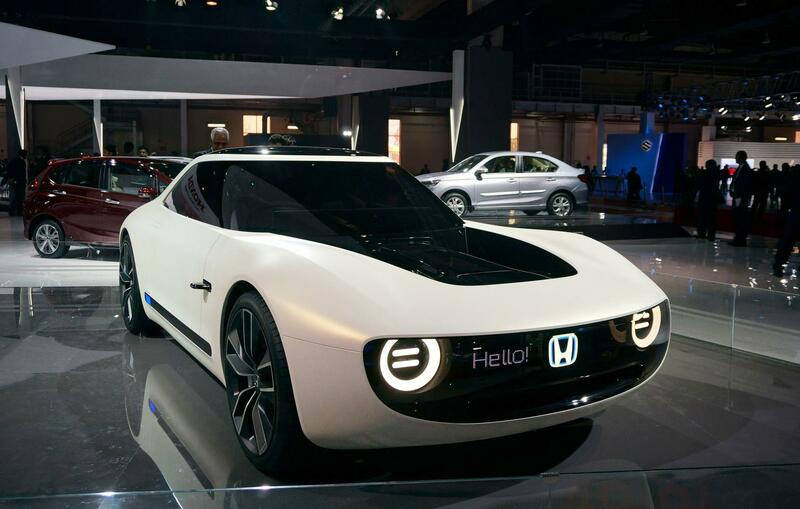 The Sports EV uses Honda’s dedicated platform which future electric cars might roll out with. It isn’t clear where the electric motor is fitted to the chassis or which axle is powered. 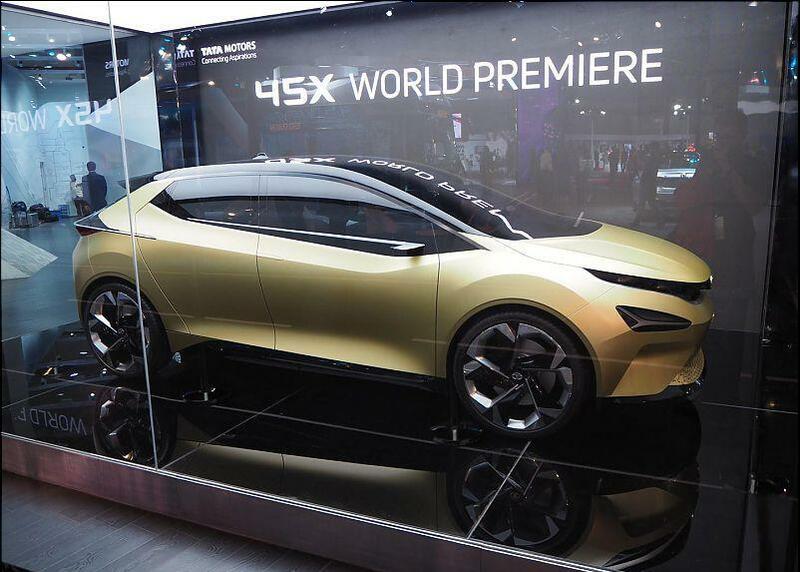 The batteries are stuffed into the floor and Honda claims that the car will have a low center of gravity. The Sports EV’s creases flow gracefully while subtly bulging fenders fail to make it look stubby. The interior and electronics details of Sports EV have been kept under wraps by Honda, though a hint of usage of artificial intelligence (AI) technology have come across. Kia’s first compact SUV in India, SP Concept was showcased at the Kia stall at Auto Expo 2018, is scheduled to launch in the second half of 2019. The SUV will be powered by BSVI petrol and diesel engines at launch. The aggressively styled concept features signature elements like the ‘tiger nose’ grille, closely flanked sleek wraparound LED headlamps with dynamic turn indicators. If the styling bits from the Concept make it to the compact SUVs production model, it is sure to be a head-turner!. It will be Kia’s debutant to go on sale in the Indian market, slated for a 2019 launch. Once launched, the SP is expected to rival the Hyundai Creta and the Renault Captur. With Electric vehicles set to become big soon, Hyundai offers a glimpse of its expertise in this segment. 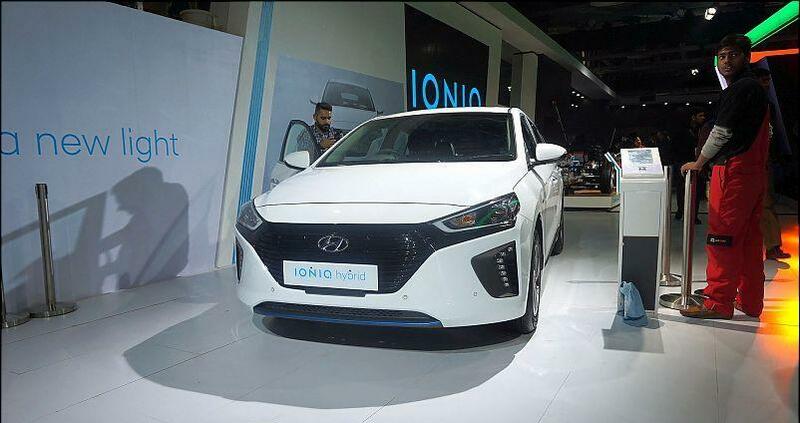 The Korean carmaker showcased its Ioniq EV along with its hybrid version at the Auto Expo 2018. Ioniq looks more like a concept than a production model, as you get a glimpse into the future technology alongside Hyundai’s latest styling cues and a high-deck boot. The Ioniq EV and Hybrid differ in their details with the latter getting exclusive copper-colored accents, while the plug-in hybrid which isn’t on display at the Expo gets blue accents. The Ioniq range includes features like Android Auto, Apple CarPlay, wireless charging for smartphone devices, a 7.0-inch TFT instrument cluster. An innovative safety package is also offered that includes autonomous emergency braking, blind spot detection, lane keep assist, cross traffic alert and cruise control. Hyundai’s plans to launch Ioniq Hybrid in India hit a roadblock with revised GST slabs following which the carmaker pulled the plug on it. The main purpose of behind showcasing these concept cars in auto expo 2018 is to check if consumers want to buy the futuristic vehicle packed with innovative technology. Dodge Viper was one such concept that made it to production 1980’s. Mahindra XUV Aero is another modern-day concept which was is to be produced and retailed by 2020. Aero’s popularity and unfaltering queries about its launch stand to be the main reason behind the concept making it to the production line.